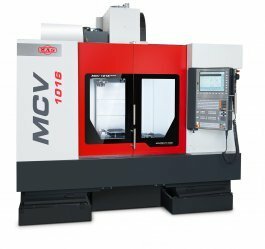 Looking for a USED MCV 1016 QUICK? kovosvit has, historically, been connected with the very beginnings of machine production at concern baťa, a.s. zlín, when in 1936, the daughter join-stock company "moravské akciové strojírny" (mas - moravian joint-stock engeneering works) was established. in 1939, a new engeneering works for manufacturing metalworking machines was built in south bohemia, at sezimovo Ústí, near to the historical town of tábor. many years of tradition and experience have gone on to the development and manufacture of machine tools, represented by products of the highest quality, as is evident in the successful, long standing activities of the firm. the join-stock company of kovosvit, a.s. is one of the six most successful exporters in the czech republic - in fact it exports about 70 % of its yearly production volume. from the beginning of machine tool production, nearly 85000 machines have been buit at kovosvit, well-known now in more than 40 countries around the world under the "mas" trade mark. "mas" machine tools are currently being supplied into the marketplace cover the following metal-working technologies: - milling - drilling and boring - turning the machines can be utilised in all main production ranges (pieces and mass production). 37 ModelsView more about Kovosvit MAS, a.s. Looking to Purchase a New KOVOSVIT MAS MCV 1016 QUICK?